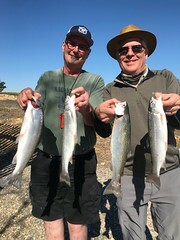 New clients Mark and Wayne were onboard with me on 8-31-2017 at New Melones. 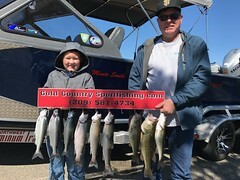 Two days prior was good fishing, so i had high hopes, after fishing nearly an hour and a half we finally had our first fish on, however the fish came off half way to the boat. The morning was tough and very slow as we were marking fish but they wanted nothing to do with us, so I was not leaving the area, i knew it would be only a matter of time before the bite turned on, and i was right for about thirty minutes they were able to land four very nice fish and lost one and that was it for the bite as it came to a halt again, but my saying is never give up and they were totally fine with what they had, they just wanted a day off from work. Then the bite started to come back as we had a starboard side rod go down so hard and it never came back up and just started burning line off the reel, I grabbed the rod and handed it to Wayne, as i slowed the boat down Wayne was fighting the fish with little gain as this was a very big fish as I cleared the way for him to fight the fish,unfortunately the big fish came off after a short fight, UGH!!!! oh well that’s fishing, we gathered our thoughts and continued on and after going through an area we had a double hook-up and they landed them both, another fifty yards we boated a yet another fish and that was number seven on the day and we called it a great day on the waters of New Melones, with two great guys. Thanks again guys!! The size of these rainbows are just amazing!!!! 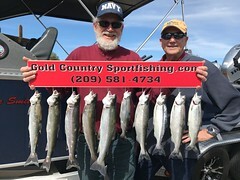 This entry was posted in California, Gold Country, Gold Country Sport Fishing, New Melones, New Melones fishing guides, Rainbows, Trout. Bookmark the permalink. Thanks for a really good fishing trip. Mark and I will not soon forget your hospitality hope to see you soon on the Sacramento River for the salmon run.